At this point most folks are familiar with this amazing beverage and for good reason! Golden Milk is a delicious, turmeric-based drink that’s a traditional home remedy in India, where it’s known as Haldi Ka Doodh, commonly drank for colds, flus, coughs, and congestion. It’s also often enjoyed simply as a nourishing and calming before-bed tea. Turmeric has been touted to have every health benefit under the sun but here are a few that are true: It definitely decreases chronic, systemic inflammation when taken consistently over time. 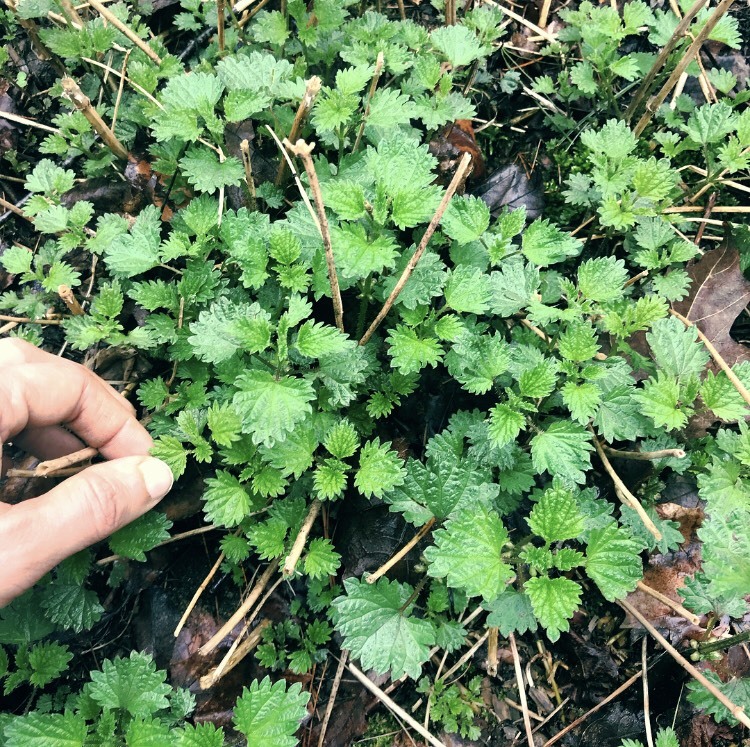 It’s a vulnerary herb amazingly healing for the skin and especially healing for leaky gut. Many folks with lots of inflammation have injured their guts taking NSAIDS long-term and could really use this healing combo of being anti-inflammatory and gut-healing! It’s a potent digestive bitter, helping us absorb our nutrients and digest our food better (the root of health). And it’s super potent antioxidant, helping fight cancer-causing free radicles in the body. In counties where just 1 tsp/day of turmeric is consumed (largely in food) cancer rates are upwards of 10x lower than in the U.S.! It’s pretty drying though so more than 1 tsp/day isn’t really recommended, or you can mix it with demulcent herbs, such as cinnamon in this Golden Milk🧡 I make what I call Instant Golden Milk balls by mixing turmeric powder with cinnamon, ginger, and cardamom powder and a pinch of black pepper. Then I mix it with a combination of raw honey and ghee (at a mix of about 75% ghee and 25% honey) until I have a dough-like consistency. I roll them into little balls, store on the counter in a mason jar, and then simply dissolve one into hot water/milk when I want a quick cup of instant Golden Milk! See the details for this recipe below! It’s loosely based on the classic Golden Milk recipe, but so many other herbs could be added to this kind of herbal paste preparation, like adaptogens, different spices, and so on- let your imagination and creativity go wild! Start by making your powder portion. I recommend making a large batch because these never go bad and don’t even need to be refrigerated! You can make 1 part equal whatever unit you want, so, for example, for the recipe above if you make 1 part equal 1 cup then you’d be using 1 cup turmeric powder and 1/8th cup each (or 2 tbsps) for the cardamom, cinnamon, ginger, and black pepper. Next, add in the ghee and honey at a ratio of approximately 75% ghee and 25% raw honey. This is kitchen medicine, so basically what you’re going for is a consistency and taste that you like. To make, I recommend adding a little of the ghee and honey at a time, then mixing, and then adding more and mixing. Keep adding the ghee and honey (you need less than you think) and mixing until it gets a dough-like consistency that you can easily roll into little balls, about 1 inch in diameter, using approximately 1.5 tsp/ball. Don’t worry- your hands won’t be permanently stained yellow, but watch-out because it can stain your clothes! One pound of honey and the ghee made from one pound of butter (the jar size that’s usually sold in stores) will be more than enough if you decide to make 1 part equal 1 cup. If you’re a measurements person, keep track of how much powder and honey and ghee it took for you get your desired consistency and taste (maybe you like less ghee and more honey, etc) in a kitchen journal. Dosage & Use: For a daily medicinal dose of turmeric eat 1 ball/day. No need to be refrigerated. These can definitely just be eaten as-in, or they can be dissolved into warm milk (any kind) or water to make an instant cup of Golden Milk- my favorite way to use this paste! Ashwagandha is a lovely addition too. An alternate way to use this preparation is to use this as a spice base for a dish, simply melt on a pan and use as the ghee-honey-spice base for whatever you’re making! You can leave-out the honey if you plan on using it this way but it’s such a small amount that the sweet flavor really hardly comes through once you add it to an entire dish. It’s a versatile preparation- enjoy! Ghee comes to us by way of Indian cooking and Ayurvedic medicine where it has been revered as a medicinal food for millennia. It’s a total staple in our home and one my all-time favorite concentrated sources of good quality fats. I’ve really been loving it so much lately and decided it was time to write a post about it and spread the ghee love! So what is it? Essentially, it’s clarified butter. In the process of making it the water part of butter evaporates and the milk solids separate out from the fat, leaving us with just the nutrient-rich oils found in butter. Because the water and milk solids are removed you get much more fat (good fats!) per serving than butter. It’s a suitable dairy alternative for folks allergic to dairy (although folks should always be cautious trying it the first time if they have a severe daily allergy) because the milk solids like lactose, which are what cause allergic immune reactions, are strained-out in the process of making it. It has a very high smoke point (485 degrees) making it a wonderful high-heat oil, great for browning aromatic spices for all kinds of dishes, for greasing pans when baking cakes, cookies etc, for frying, sautéing, and can also be substituted for butter in any recipe, including breads, cakes, cookies, and so on. It also makes a delicious swap for butter on bread, on grains, and anywhere else you use butter. It’s also traditional to infuse herbs into ghee! Carries the medicinal properties of deeper into the tissues of the body (anupana/vehicle). For this reason its traditional to infuse herbs into ghee- check-out our post on Ashwagandha Ghee for a recipe! This is also part of why its so beneficial to brown the healing aromatic spices in ghee when you’re cooking. When possible make this with grass-fed/pastured butter- I love the Kerrygold brand. Put the butter in a medium-sized pot and heat gently on medium heat until the butter starts to melt, then reduce heat to low. Cook until the butter just starts to boil and continue cooking on this low temperature with the lid off the pan. The butter will often start to sputter and foam as it cooks and then start to quiet down. This is the water portion cooking off. In about 12-15 minutes your ghee will start to smell like popcorn and turn a lovely golden color, and whitish curds will form on the top of the golden-colored ghee, which are the milk solids separating from the fat. At this point start watching your ghee very closely to be sure that it doesn't burn! Soon the whitish curds will turn a light brown color and the boiling will quite down, which means that your ghee is ready! The total cooking time should not be longer than 15-20 minutes. Remove the pan from the heat and let the ghee cool until it is just warm and the solid curds have mostly settled to the bottom. Strain the ghee through cheesecloth into a dry glass jar. 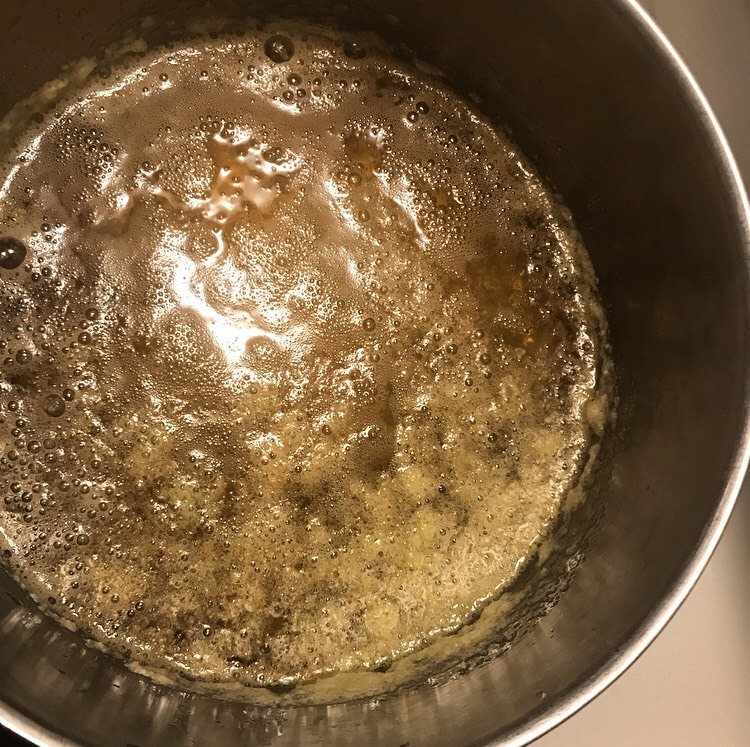 Its important to be sure that no water comes in contact with your finished ghee product, since this will promote bacterial growth and cause you ghee to go bad. If you want your ghee to have a super smooth consistency, then cool it in the fridge. Ghee is shelf-stable and can be stored unrefrigerated. It’s said to improve with age although I’ve never had a batch around long enough to test this! I hope you love ghee as much as I do-Enjoy!